IS YOUR HELMET PROTECTING ANY BETTER THAN 20 YEARS AGO? The dangers of old safety standards. Among injured cyclists, head injuries account for approximately two thirds of hospital admissions and three-quarters of fatal injuries. Helmets reduce the probability and the severity of skull fractures and traumatic brain injuries as a result from deceleration of the head. Many helmet safety standards were issued about 20 years ago and still have the same limitations in maximum deceleration. While the automotive industry advanced the safety of cars continuously for decades, sports markets clearly need to catch up. All helmets have to meet safety standards that are set by governments. The safety standards are designed to mimic actual head impacts by dropping a headform with a helmet with a certain velocity onto an anvil. The maximum deceleration is measured and has to be below the standard’s limit, which is typically between 250 and 300 g in the international safety standards. SO HOW MUCH DECELERATION CAN YOUR SKULL OR BRAIN REALLY TAKE? The maximum allowed values in many helmet safety standards correlate with a high probability of suffering severe head injuries. The correlated risk of suffering a skull fracture can be as high as 40% when a rider wears a European certified bicycle helmet and impacts the helmet at the reference velocity of 19.5 km/h or 12.1 mph. That risk may increase up to 79% for helmets tested to the US bicycle helmet safety standard at the higher reference impact velocity of 22.3 km/h or 13.9 mph. And at a reference velocity of 27 km/h or 17 mph, a certified European motorcycle helmet is allowed to comply with limits that correlate with a shocking 97% risk of suffering a severe traumatic brain injury and a 77% risk that the injury is fatal. The risk assertions are based on the Prasad/Mertz head injury risk curves that are used in the automotive industry to evaluate acceptance criteria for several tests in NCAP programs around the world. The probability of suffering a skull fracture correlates with the maximum deceleration of the head during an impact. In the European and American safety standards the maximum allowed values are 250g and 300g respectively. At 250g the correlated risk of suffering a skull fracture is 40% and at 300g that risk almost doubles to 79%. Some impacts last longer than others and to evaluate the total energy transferred to your brain during an impact a metric called the Head Injury Criterion or HIC was developed. Research from the car industry has shown that HIC correlates with the risk of suffering severe traumatic brain injuries. HOW DO YOU FEEL ABOUT THE CURRENT LIMITS ALLOWED IN THE HELMET SAFETY STANDARDS? HELMETS NEED TO ABSORB MORE ENERGY. Complying with lower limits to achieve less than 5% risks. To pass voluntary lower limits, helmets either need more energy absorption material or a better performing energy absorber. Fortunately, technology has progressed. and based on the Prasad/Mertz head injury risk curves. Honeycombs are generally regarded as outstanding impact absorption cores with very linear impact performance and hardly any negative rebound effect. The Koroyd thermoplastic tubular honeycomb core has proven to outperform EPS as an absorption liner material inside protective helmets, with maximum deceleration values often 25% to 35% lower than EPS and HIC values up to 58% lower than EPS with the same liner thickness. 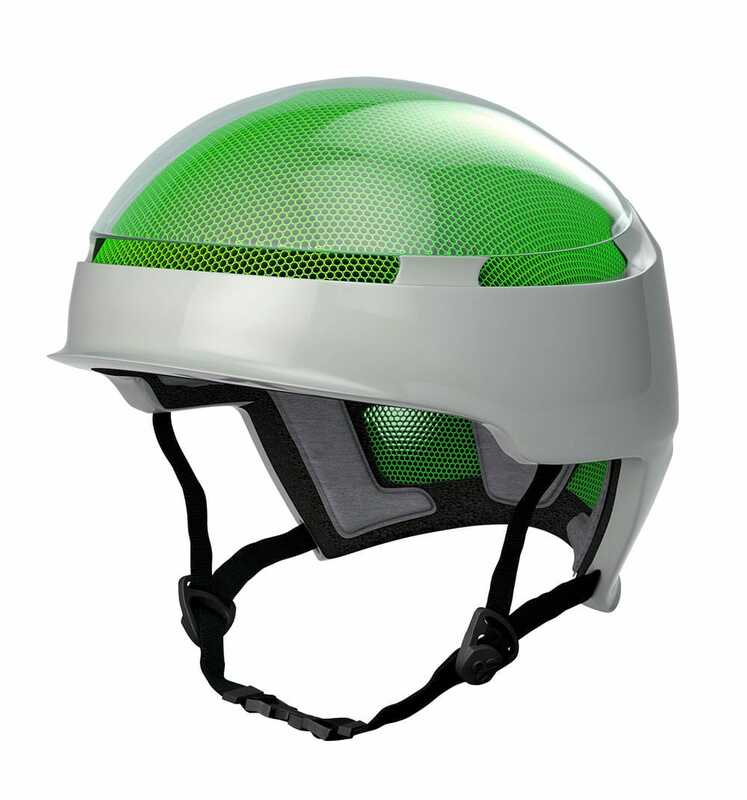 With Koroyd absorption liners, bicycle, snow and motorcycle helmets can already pass the limits that correlate with a less than 5% risk of suffering a skull fracture or fatal traumatic brain injury, without increasing the size of the helmet. Next generation helmets, with significantly improved energy absorption capabilities will reduce the severity of head injuries and save many lives. The approach of the voluntary lower limits of this helmet safety initiative is endorsed by Dr. Prasad, one of the original developers of the head injury risk curves for the automotive industry. As safety standards are unlikely to change in the next years to come, it’s up to helmet manufacturers to step up and build these helmets. At Koroyd, we’d love to help. In this graph here you see the deceleration graph of a high-end EPS based motorcycle helmet. This impact led to a maximum deceleration of 185 g and an HIC of 1838. We then replaced the EPS with our Koroyd core in a second helmet and managed to reduce the maximum deceleration to 126 g and the HIC to 768. The correlated risk of suffering a skull fracture was reduced to < 1% while the correlated risk of fatal traumatic brain injury was reduced from 77% to almost non existing for this impact. Helmets reduce the probability and severity of skull fractures and traumatic brain injuries as a result from sudden deceleration of the head. We are dedicated to creating better helmets. Helmets that are lighter, more durable, more breathable, more sustainable – but foremost – THAT PROTECT BETTER. Koroyd equipped helmets can already comply with the lower limits that correlate with a less than 5% risk* of suffering a skull fracture and less than 5% risk* of suffering a fatal traumatic brain injury in bicycle, ski and motorcycle markets. * When impacted under the same conditions as described in the helmet safety standard. Correlated risks are averages and based on the Prasad/Mertz head injury risk curves. “Its time to re-evaluate the helmet standard and put it at a level where the technology can allow. I’ve spent over 40 years analysing automotive accident data and developing safety systems. I developed these risk curves together with Dr Mertz to evaluate the likelihood of someone suffering severe head injuries like a skull fracture or traumatic brain injury. The curves have been used by the US department of transportation to set acceptance criteria for head injuries in several crash standards. They are also used in car safety program around the world and have also been re-validated recently. The HIC limit of 2400 in the motorcycle helmet is way too high. If a pedestrian is hit by a car we allow a maximum HIC of 1000. If the same person falls off his bike HIC 2400 is allowed. It just doesn’t make sense and worse of all it leads to too many severe head injuries and fatalities. Hopefully one day the risks of suffering severe head injuries in various sports activities can be as low as when driving a car. Till that time this helmet safety initiative with these voluntary lower limits for deceleration and HIC is a major step in the right direction that will improve rider safety very significantly. “Koroyd is the only material that has been specifically engineered to significantly improve energy absorption and hence helmet safety. Improving helmet safety is about how well you can manage the impact energy. This usually means increasing the amount of energy absorbing material used in the helmet or using materials that are more efficient when absorbing energy. Traditional materials have been empirically derived from those used in the pacakging industry and the helmet safety standards reflect this. The development of the Head Injury Risk Curve (HIRC) and the Skull Fracture Risk Curves (SFRC) that were proposed by Prasad and Mertz m for the adult driving population are reviewed, and the problem with using the Maximum Likelihood method to analyze the cadaver 15ms HIC data is discussed. The cadaver data base for skull fracture is expanded by including non-fracture 15ms HIC values for a number of cadavers which had skull fractures at higher impact severities and by including cadaver test results of Ono and Tarriere. This expanded data set was analyzed using the Mertz/Weber method and a new method called “Certainty Grouping”. An updated version of the Skull Fracture Risk Curve (SFRC) is proposed. The efficacy of this revised curve is demonstrated by comparing its predictions to the results of simulated fracture impacts using a finite element model of the head. The HIRC was not changed since no additional brain damage data were analyzed. The efficacy of the HIRC is demonstrated by comparing its predictions of head injury reductions due to the introduction of airbags and due to improvements in football helmets. The cadaver data of Nusholtz and Stalnaker were added to the expanded cadaver skull fracture data. These data were analyzed to determine the relationship between peak resultant head acceleration and the risk of skull fracture. For equal risk of skull fracture. the 15ms HIC criterion is more discerning because it is time dependent. An evaluation of the four injury risk curves proposed in the NHTSA NCAP for estimating the risk of AIS>= 3 injuries to the head, neck, chest and AIS>=2 injury to the Knee-Thigh-Hip (KTH) complex has been conducted. The predicted injury risk to the four body regions based on driver dummy responses in over 300 frontal NCAP tests were compared against those to drivers involved in real-world crashes of similar severity as represented in the NASS. The results of the study show that the predicted injury risks to the head and chest were slightly below those in NASS, and the predicted risk for the knee-thigh-hip complex was substantially below that observed in the NASS. The predicted risk for the neck by the Nij curve was greater than the observed risk in NASS by an order of magnitude due to the Nij risk curve predicting a non-zero risk when Nij = 0. An alternative and published Nte risk curve produced a risk estimate consistent with the NASS estimate of neck injury. Similarly, an alternative and published chest injury risk curve produced a risk estimate that was within the bounds of the NASS estimates. No published risk curve for femur compressive load could be found that would give risk estimates consistent with the range of the NASS estimates. Additional work on developing a femur compressive load risk curve is recommended. In 1983, General Motors Corporation (GM) petitioned the National Highway Traffic Safety Administration (NHTSA) to allow the use of the biofidelic Hybrid III midsize adult male dummy as an alternate test device for FMVSS 208 compliance testing of frontal impact, passive restraint systems. To support their petition, GM made public to the international automotive community the limit values that they imposed on the Hybrid III measurements, which were called Injury Assessment Reference Values (IARVs). During the past 20 years, these IARVs have been updated based on relevant biomechanical studies that have been published and scaled to provide IARVs for the Hybrid III and CRABI families of frontal impact dummies. Limit values have also been developed for the biofidelic side impact dummies, BioSID, EuroSID2 and SID-IIs. The purpose of this paper is to provide in a single document: 1) a listing of the IARVs for measurements made with the Hybrid III and CRABI families of frontal impact dummies, and for the biofidelic side impact dummies, 2) the biomechanical and/or scaling bases for these IARVs, and 3) a comparison of IARVs and regulatory compliance limits and how they affect restraint design. The development of the Head Injury Risk Curve (HIRC) and the Skull Fracture Risk Curves (SFRC) that were proposed by Prasad and Mertz for the adult driving population are reviewed, and the problem with using the Maximum Likelihood method to analyze the cadaver 15ms HIC data is discussed. The cadaver data base for skull fracture is expanded by including non-fracture 15ms HIC values for a number of cadavers which had skull fractures at higher impact severities and by including cadaver test results of Ono and Tarriere. This expanded data set was analyzed using the Mertz/Weber method and a new method called “Certainty Grouping”. An updated version of the Skull Fracture Risk Curve (SFRC) is proposed. The efficacy of this revised curve is demonstrated by comparing its predictions to the results of simulated fracture impacts using a finite element model of the head. The HIRC was not changed since no additional brain damage data were analyzed. The efficacy of the HIRC is demonstrated by comparing its predictions of head injury reductions due to the introduction of airbags and due to improvements in football helmets. The cadaver data of Nusholtz and Stalnaker were added to the expanded cadaver skull fracture data. These data were analyzed to determine the relationship between peak resultant head acceleration and the risk of skull fracture. For equal risk of skull fracture, the 15ms HIC criterion is more discerning because it is time dependent. A review and analysis of existing cadaver head impact data has been conducted in this paper. The association of the Head Injury Criterion with experimental cadaver skull fracture and brain damage has been investigated, and risk curves of HIC versus skull fracture and brain damage have been developed. Limitation of the search for the maximum HIC duration to 15ms has been recommended for the proper use of HIC in the automotive crash environment. The COST 327 action was established with seven research topics, with a timetable and four main onjectives, all to be achived using a wide range of European experience to determine or modify national approaches. The first was to establish the distribution and severity of injuries experienced by motorcyclists, concentrating on the head and neck. The second was to determine the most significant head and neck injury mechanisms. mechanisms was to be established. The overall findings were to be used to propose a specification for future testing of motorcycle helmets in Europe. All risk assertions in the initiative have been made using the Prasad/Mertz head injury risk curves. The risk curves cannot accurately predict the risk of injury from an impact. Actual risk of injury will vary from person to person and depends on many factors, including but not limited to the impact velocity, the angle of the impact, the impact surface, as well as the age, weight and physical condition of the rider. The correlated risk of suffering a skull fracture or fatal traumatic brain injury is reduced to less than 5% according to the Prasad/Mertz risk curves for impacts with a maximum deceleration of 183 g and maximum HIC value of 1666. No helmet can protect riders from any and all injuries. When riding, please wear a helmet. You state that “Koroyd equipped helmets can already comply with the lower limits that correlate with a less than 5% risk* of suffering a skull fracture and less than 5% risk* of suffering a fatal traumatic brain injury in bicycle… markets” but are there any current Koroyd-equipped models that do comply with these limits? The only helmets I know of in production that use Koroyd are the Smith Overtake and Smith Forefront. I don’t know if they comply with the limits. Could you please direct me to information relevant to how your design mitigates angular forces? I’m a clinician and not an engineer but my understanding of deceleration and the HIC is that they are all about linear forces, which are associated with motorcycle and bike crash related TBI much less frequently than angular forces. There is indeed a lot of discussion at the moment regarding rotational and angular forces and rotational forces are a major contributor to severe head injuries. Independent studies have shown there is a strong correlation between peak rotational acceleration and peak linear acceleration, i.e if you can reduce linear energy then you are likely also reducing rotational. There is no standard test to measure rotational acceleration yet so we do not make any claims regarding Koroyd equipped helmets in this scenario, however by significantly reducing the linear acceleration is also expected that the angular acceleration will be reduced too. Since we have your email address we will send you more details of the correlation between rotational and linear forces. On Saturday I was in an accident. The car that hit me was moving perpendicular to my lane of travel (cross streets). I was moving at over 20 mph and the car was doing about 40 mph. I was wearing the Smith Overtake helmet which has the Koroyd layer around my head. My bike hit the car first, shattering the carbon fiber frame, my body hit the windshield, shattering the safety glass, my head hit the roof of the car, denting the roof and shattering the polycarbonite air-dam over the sun-roof. I then rebounded off the car and struck my head on the pavement. I was then repeatedly struck from the car as it tried to slow down. My injuries were compression fracture of my L4, lacerations, an impingement on my left hip (side that was struck by car), and some scrapes on my face. CT confirmed no concussion or brain trauma.